Brazil two more golden roses. One would have to think long and hard before coming up with the name of anyone whos done as much for Brazilian music in the past 37 years as the inimitable Hermínio Bello de Carvalho. Writer, poet, producer, director, cultural agitator and preservationist, talent scout and magic-wand waver, Hermínio seems to have always been there at crucial moments in MPB history, putting his finger on the pulse of things and his signature on major milestones. Hermínios list of accomplishments is practically endless. Hes lyricist to the choicest assemblage of composersmelodies by Pixinguinha, João Pernambuco, Cartola, Jacob do Bandolim, Paulinho da Viola, Elton Medeiros, Sueli Costa, Maurício Tapajós, João de Aquino, Guinga, and Villa-Lobos have been embellished with his verse. A talent spotter extraordinaire, hes guaranteed a place in heaven just for the discovery of Clementina de Jesus. Some of the most important shows and albums ever to be launched in BrazilRosa de Ouro; Elizeth Cardoso with Jacob do Bandolim, Zimbo Trio & Época de Ouro; Gente da Antiga; Som Pixinguinha; Valzinho, Doce Veneno; Ary Amoroso; Mangueira, Sambas de Terreiro e Outros Sambas; and Clementinas centenary 8-CD box are but a few of over 100 such productionshad Hermínio as their conceptual father and midwife. For thirteen years he directed the musical division of Funarte, and it is him we have to thank for the precious collection of 65 albums known as Acervo Funarte (see the remaining 45 discs here). He could be resting comfortably on his laurels, but the indefatigable Hermínio keeps at it. This year he brought to life two more beauties, both released by the newish label Biscoito Fino, which aims high and hits the target with remarkable consistency. Like Hermínio, Zezé Gonzaga is a national treasure. Younger listeners will have heard her gently mournful voice accompanied by guitarist Mauricio Carrilho in Solidão on Lumiars Songbook Antonio Carlos Jobim Vol. 5 and in Valsinha on Songbook Chico Buarque Vol. 3. American MPB fans may have picked up Great Voices From Brazil (ANS Records 12220-2), a Stateside reissue of As Eternas Cantoras do Rádio, in which Zezé teams up with several other veteran divas. Three years ago she released the duo CD Clássicas (another Hermínio production) with Jane Duboc. Now she and Hermínio regale us with Sou Apenas uma Senhora que Ainda Canta, a solo album that was a long time comingit's the singers first since Valzinho, Doce Veneno of 1979. Hermínio is a fiercely loyal friend and producer. He produced practically all of Elizeth Cardosos albums from the mid-60s until the end of her life. In Sou Apenas uma Senhora que Ainda Canta, he found a way to shine the spotlight on both his favorite singers by having Zezé Gonzaga record A Divinas repertoire. At the age of 76, Zezé is as capable as ever (perhaps more than ever) of breaking your heart. In this dignified and lyrical production shes accompanied by musical director/arranger Cristovão Bastos on piano and accordion; João Lyra on guitar; Jorge Helder on bass; Hugo Pilger on cello; and Ricardo Pontes on saxophone. Its an exercise in beauty from beginning to end. (Biscoito Fino BF 518; 2002) 54:58 min. In 1965 and 67, Hermínio staged the legendary musical (and subsequent two albums) Rosa de Ouro, showcasing samba classics sung by old and new talent. 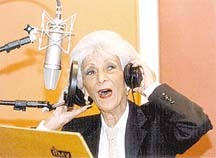 The former was represented by veteran actress/singer Araci Cortes (19041985) and the even older new discovery Clementina de Jesus (19011987). Among the latter, Paulinho da Viola and Elton Medeiros, along with sambistas Nelson Sargento, Jair do Cavaquinho, and Anescar do Salgueiro, who went on to found the samba groups A Voz do Morro and O Cinco Crioulos. Rather than repeat Rosa de Ouro, Hermínio produced a new stage show and double CD with a similar formula: a well-researched samba repertoire performed by veterans singing solo and younger vocalists performing in a roda-de-samba setting. He called it O Samba É Minha Nobreza. The soloist this time is Roberto Silva, Brazils most perfect living traditional singer, whose vocal beauty is still intact at the age of 82. No roda de samba would be complete without Cristina Buarque, who carries in her head more samba history than any carioca. She helped with the repertoire selection and leads the communal singing, which is done by young performers who appear regularly at Lapa bars such as Semente, where rodas de samba are the main attraction. Hermínio likes to arrange his shows and discs in thematic blocks. A classic example of this construction may be found in Dorival Caymmis 70th birthday show, reissued on the PolyGram CD Caymmi in Bahia. 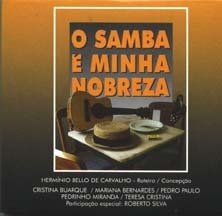 In O Samba É Minha Nobreza, the themes are samba history; morro and favela songs; work-related songs; sambas about machismo; money (or lack thereof); and the nobility of samba. The resulting hefty 68-song list leaves no room for lyrics in the CD bookleta pity for non-Brazilian listeners, who dont know all these sambas by heart and wont be able to sing along. Even without the possibility of a sing-along, this set is the closest most people will ever get to having a roda de samba at home. The expert arrangements were done by Paulão Sete Cordas, who also plays his 7-string guitar and sings. Joining him are ace percussionists Marcus Esguleba and Trambique; Bernardo Dantas (6-string guitar); Marcelo Bernardes (flute); Roberto Marques (trombone); Pedro Aragão (bandolim & banjo), Mariana Bernardes (cavaquinho), and Zé Cruz (straw hat). Hermínio, youve done it again. See the complete track list and listen to audio samples here. (Biscoito Fino BF 516; 2002) CD 1: 52:41 min. ; CD 2: 49:48 min.